This book may be used along with Mel Bay's Mandolin Christmas Songbook (MB21013) and Mel Bay's Ukulele Christmas Songbook (MB20886). All songs, except "Away in a Manger" are in the same key and can be played together. 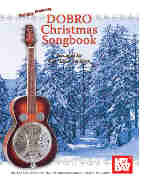 Most songs in Mel Bay's Tenor Banjo Christmas Songbook (MB21014) are also in the same key and can be used together.